⬅ Welcome to Beer Exam School! More people are familiar with the term sommelier (pronounced: sum’əl yā), which describes a highly knowledgeable and skilled wine professional. Sommeliers are experts at choosing the right wine for your meal, and providing an exceptional wine experience by ensuring the proper storage and handling of wine. Lots of good restaurants have a good wine list, the best will have a certified sommelier on staff. Sommeliers have attained a sort of urban legend status as being able to accurately identify a wine using just taste and smell. The best, legend has it, can indicate not only type of wine and year, but which region it came from, which winery made it, and in which vineyards the grapes grew—just by smelling the wine. Several friends recommended that I watch the documentary movie Somm. I’ve never seen a sommelier at work in person, but the movie was a great account of the mad skillz these people possess. Cicerone (pronounced: sisəˈrōn) is sort of the sommelier of the beer world. In fact the official Cicerone® Certification Program website even describes the certification in reference to the sommelier designation. “Beer has always suffered as sort of the ugly stepson of wine, particularly in American culture,” says Sam Calagione, founder and President of Dogfish Head Craft Brewery Inc.
Beer doesn’t need to be second best to wine. Beer doesn’t need to be spoken of in reference to something else. I contend that beer is independent of wine. As a beverage, beer is able to stand on its own. Beer experts are able to, also. I propose a new way of describing the craft of Cicerone. First, let us understand a few things. 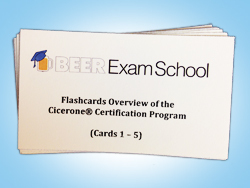 Cicerone® Certification Program was founded by Ray Daniels in 2007. They started giving tests in 2008. Ever since, it has multiplied like yeast in a carboy. Cicerone® certification mark and service mark is registered by the Craft Beer Institute, which is owned by Daniels. Daniels has written about beer for years and is a senior faculty member at the renowned brewing school, Siebel Institute of Technology. Next, let’s start talking about a beer Cicerone in a new way, independent of other beverages. The Cicerone® Certification Program provides independent assessment and certification of knowledge and skills of beer servers. It’s a professional certification. So when you go out to your favorite beer establishment, a Certified Cicerone® will ensure an exceptional beer experience. They are responsible for choosing the beer in stock, and for proper storage, handling and presentation of the beer you drink. “We want people who are serving us beer, who are managing beer service for us to know what the hell they’re talking about,” explains Daniels in an interview with Taste Terminal. The knowledge and expertise of a Certified Cicerone® has been independently certified. So you can trust them for accurate information about beer ingredients, that they keep clean tap lines and they serve beer in the proper “beer clean” glassware, with the right amount of head. A Certified Beer Server can provide you with quality service based on their proven knowledge, as tested in the 5 categories noted above. A Certified Cicerone® has additional knowledge about the brewing process and can identify a style of beer or problems with a beer, just by taste. She also has more knowledge of pairing beer with food. So she can choose the perfect beer to go with your meal. “The biggest part of the job is not standing at the table talking to people about the product, but it’s doing all the prep work to deliver good product to the table,” says Daniels. In addition to at least 2 years experience selling, serving and managing beer service, a Master Cicerone® has an “encyclopedic knowledge of all issues related to brewing, beer and beer service.” Let’s put it this way: there are 13 people in the world (as of Dec 29, 2016) who show the title Master Cicerone® wherever their names appear. Trust them, they are professionals. The Cicerone® Certification Program independently verifies the knowledge, expertise, and skills of beer professionals. A Certified Cicerone® knows about beer. It is someone whose has knowledge and expertise to provide you with an exemplary beer service. These people are professionals. They are experts on beer. They are not experts on wine, nor sake, nor fruit punch. We don’t need to talk about cicerones in reference to other professions. Their credentials are esteemed enough to stand on their own. Popularity and recognition of the program is growing rapidly, so the next time you go out for a beer, you just might have a better experience than the last time. I am currently studying for Certified Beer Server exam. Many beer fans take the exam just for fun or personal enrichment. I invite you to study along with me here at BeerExamSchool.com. Study along with me toward the Certified Beer Server exam! Subscribe via email, or click here for the RSS feed.